Each month the nursery features a native plant which is looking great and is available now. 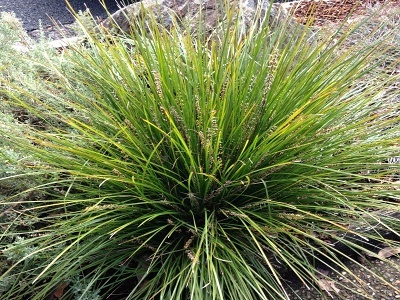 The plant of the month for April is Lomandra 'Tanika', a hardy, strappy plant with fine leaves to 80cm, an attractive soft habit and yellow flower spikes in spring. Plant in full sun to part shade in most well-drained soils. Great for mass planting, and adaptable to many landscape uses. Bird and butterfly attracting. The nursery stocks native potting mix in 25 litre bags for $11 each. This potting mix is perfect to use for growing your native plants in pots. It also contains a slow release fertiliser and a re-wetting agent. We also stock cypress mulch in 40L bags for $11 each. Mulch is great in suppressing weeds and helping retain soil moisture. Please check our April 2019 stock list to see the full range of plants currently available.